I’m signing copies of Eat, Drink, Vote at the American Public Health Association annual meeting in Boston’s convention center on Sunday, November 3. This will be at the APHA Press booth #935 in the Expo hall. Come say hello! I was recently interviewed by Maria Rodale about Eat, Drink, Vote (published, not coincidentally, by Rodale Books). Politicians in Washington may bicker back and forth about issues that don’t seem all that immediately relevant to your daily life, but their decisions do trickle down to you—three times a day, every time you sit down for a meal. Your dinner plate (and your cereal bowl and your lunch box) are ruled by politics, from the lobbyists who made your chicken cheaper to the Congresspeople who listened to food marketers’ pleas to limit restrictions on advertising to children. I’m giving The 2013 Fae Golden Kass Lecture on November 12 (details about time, place, and registration are below). The lectureship was created by gifts of the family and friends of Fae Golden Kass to support an annual lecture by a woman in the medical sciences. There was a time in the U.S. when grocery store shoppers may not have noticed that nutrition facts labels and lists of ingredients on food packages were sometimes difficult to decipher; or that high-fat, high-sugar foods were frequently marketed to children; or that unsubstantiated health claims often appeared on food packaging. That time has passed. Americans have now become more aware of, and concerned about, what’s in their food and where it comes from thanks to the work of Marion Nestle, author of Food Politics: How the Food Industry Influences Nutrition and Health, an acclaimed exposé of the U.S. food industry’s influence on food policy, which was first published in 2002. Nestle, the Paulette Goddard Professor in the Department of Nutrition, Food Studies and Public Health at New York University, can pinpoint the moment in the early 1990s when she first became aware of the politics of food. She was attending a conference at the National Cancer Institute on how behavioral factors affect cancer risk when a physician gave a presentation on how cigarettes were marketed to children all over the world. Nestle described her “absolute shock” at seeing images of cigarette advertisements displayed in remote areas of the world and at playgrounds in the U.S. While she had known that cigarettes were marketed to children, she said she never really noticed the full extent of the advertising. That’s when she had the thought that this scrutiny should go further. “We should be doing this for Coca-Cola,” she recalled thinking. In contrast, as a public health nutritionist in the 1980s and 1990s, Nestle said she remembered speakers at obesity meetings talking about how to encourage mothers to improve their children’s diets, but marketing was never discussed. Nutrition societies and professional organizations were (and still are) sponsored by food companies, she said, but nobody noticed. “I wrote Food Politics to get people to notice,” Nestle said. Nestle has done more than get people to notice since then. She has also shaped the public conversation about how politics affects what all of us eat. Food safety, labeling, ingredients, agribusiness, health claims, obesity, nutritional supplements, marketing practices—Nestle has researched and written about it all. Her work examines scientific and socioeconomic influences on food choice, obesity and food safety, with an emphasis on the role of food marketing. 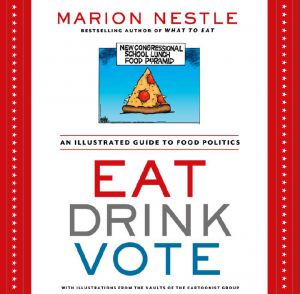 Nestle’s most recent book is Eat, Drink, Vote: An Illustrated Guide to Food Politics. Her blog, Food Politics, includes a wealth of information on food and nutrition policy. Nestle will present the 2013 Kass Lecture, titled “Food, Nutrition and Public Policy: Science vs. Politics” for members of the Harvard community in the HMS Walter Amphitheater, TMEC, 4-5 p.m. on Nov. 12. A reception and book signing will follow. To register, click here. By Jocelyn Zuckerman (published originally by On Earth, republished by Civil Eats, and now here). Recently she published her new book, Eat, Drink, Vote, an admirably approachable look at wide-ranging issues such as farm subsidies, obesity, genetically modified foods, and trans fats. On the eve of its release, Nestle and I sat down over lunch to discuss, among other things, lunch. Ours was fine—Caesar salad for her, Niçoise for me—but the lunches that dominated the conversation weren’t the ones on our plates. Rather, we talked about the meals that our nation’s kids will be loading onto their trays in the new school year. It’s an issue that Nestle cares deeply about, and for good reason. For starters, school lunches (and breakfasts) tend to represent the lion’s share of the nutrition that a low-income child will get in a day. (For the truly impoverished, they may be the only meals children get.) The food served sets an example to a “large, captive, impressionable audience,” as Nestle puts it in the book, making cafeterias key battlegrounds in the fight against obesity and poor nutrition. And it’s certainly a fight. Throughout Eat, which features some 250 food-related cartoons by illustrators around the country, Nestle calls out the entrenched powers—namely, our Congressional representatives and the deep-pocketed food and beverage lobbies to whom they seem ever more beholden—working at cross-purposes to the folks fighting for a food policy focused on promoting our own well-being and that of our environment. Just look at what happened in 2011, when the U.S. Department of Agriculture (USDA) tried to rate tomato paste based on its true nutritional value. School pizza makers went running to their friends in Congress, who promptly blocked the USDA’s decision. So an eighth of a cup of tomato paste is still credited with as much nutritional value as a half a cup of vegetables. Nestle chose a cartoon that wittily depicts the you-must-be-kidding-me moment (by Pulitzer Prize-winner Mike Peters) for the cover of her book. There’s no question that school meals are big business. In 2011, the USDA school breakfast program served nearly 12 million children, at a cost of nearly $3 billion, Nestle writes in Eat, while the lunch program served nearly 32 million children, at a cost of $11 billion. The companies involved in providing all that food have a serious interest in holding on to their share of that money, preferably while investing as few resources as possible. “Any change in the standards means that the products that have been created specifically for school lunches [that pizza, for example] have to meet new standards,” Nestle pointed out over lunch. “And that pisses everybody off”—everybody who’s already making money off school meals, that is. Which makes it all the more remarkable that those meals have, in fact, gotten better. In December 2010, Congress passed the Healthy, Hunger-Free Kids Act. The legislation marked the first time in a generation that school lunch regulations had been updated. (One telling example of just how much our dietary landscape has changed over the decades: the previous laws featured minimum calorie levels but no maximums.) The new act gave USDA the power to establish nutrition standards for all of the food sold and served in schools. In addition to lunches and breakfasts, this includes the so-called “competitive foods” available from vending machines and carts. There are now limits on the levels of saturated fat, trans fat, sodium, and calories, and the standards require that snacks be rich in whole grains and provide nutritional value. Drinks can contain no more than 40 calories per 8 fluid ounces, or 60 calories per 12 fluid ounces—numbers that rule out all regular sodas and Gatorades. Healthier for kids also means healthier for the environment. (Another cartoon in the book, by Joel Pett, aptly illustrates the direct link between “soft-drink pushers” and damage to the natural landscape.) There’s a direct impact on the supply chain when school lunches are heavier on organically grown produce instead of (corn-fed) chicken coated in cornmeal and deep-fried in corn oil, for example. Given the numbers involved, healthier school lunch standards should ultimately mean a shift in what is being grown and raised in this country. Fewer sodas in vending machines means less demand for high-fructose corn syrup and less acreage devoted to monocultures of corn. Fruit and vegetable salads replacing chicken fingers means less demand for antibiotic-laden factory-farm birds. In a logical world, greater demand for healthy crops to produce federal school lunch meals would translate into more support for them in the next Farm Bill. I asked Nestle about who’s getting it right, and she replied that the now-somewhat-famous program at the Calhoun School, located on Manhattan’s Upper West Side, represents “the Platonic ideal” of what a school lunch operation can be. It doesn’t come as a huge shock that children eat well at an educational institution that charges in the neighborhood of $40,000 a year per student, but the man behind the program, French Culinary Institute-trained “Chef Bobo,” doesn’t just cook for rich kids. He is a frequent speaker at conferences around the country on school lunches and healthy eating, and he regularly brings in cooks from other schools to intern in his kitchen, which features produce and chickens sourced from local vendors and includes a vegan option every day (see one of his recipes to the left). Several of Bobo’s sous chefs have gone on to start similar lunch programs at other schools, including at a public charter school in the Bronx. Nationwide, Nestle said, there are more farm-to-table programs linking students with local farmers than ever before. Schools in cities and in the countryside are sowing their own kitchen gardens, and the three-year-old Food Corps supports a network of volunteers who work in poor communities to teach kids about healthy food, build school gardens, and help bring better food into public-school cafeterias. Sure, school lunches still need work—someday that tomato paste will be called out for what it really is—but the fact is, we’ve come a very long way. “Look back ten years!” Nestle said in regard to the overall shift in this country’s dietary landscape. “Healthy food has gone mainstream.” Despite the entrenched interests, she said,changes are happening, in large part because Americans better understand the importance of what they put in their mouths. With Eat, Drink, Vote, the badass lunch lady furthers the cause. Jocelyn Zuckerman is the former articles editor at OnEarth, the former executive editor of Whole Living and deputy editor of Gourmet, where she won a James Beard Award for feature writing in 2002. She is also an adjunct professor at the Columbia University Graduate School of Journalism and has written for the New York Times Magazine, Parade, and Plenty. Government held hostage over health care? What a strange society we live in. We need a sense of humor at a time like this. Here’s a commentary on the whole situation from my new book, Eat, Drink, Vote: An Illustrated Guide to Food Politics. 1. The Cartoonist Group is sponsoring a caption contest. The winner gets a signed copy of the book. 2. If you live in New York: copies will be available at the Union Square farmers’ market tomorrow (Wednesday) from noon to 1:30 p.m.
A new book, “Eat, Drink, Vote,” has more than 250 cartoons that take a humorous look at food topics. When it comes to diet, weight and food politics in this country, cartoons often make the messages easier to swallow. Nestle shares more than 250 of her favorite cartoons and comics in her new book, Eat, Drink, Vote: An Illustrated Guide to Food Politics, (Rodale Books, $18.99) created in collaboration with The Cartoonist Group. 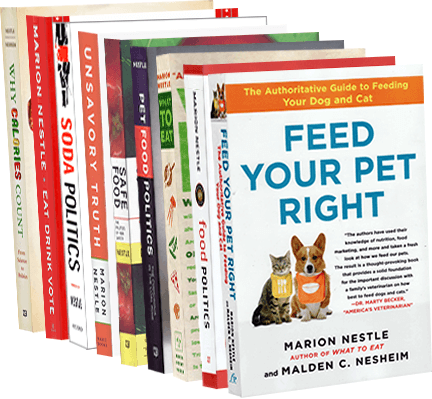 For years, Nestle has hounded the food industry about its marketing strategies, which she detailed in her 2002 book, Food Politics. In 2006, she detailed how to grocery shop for a healthful diet in What to Eat, and in 2012 she discussed the latest science on what causes people to be overweight in Why Calories Count, written with Malden Nesheim. Nestle believes that the obesity problem is this country is fostered by a food environment that encourages people to eat more often, in more places and in larger amounts than is good for maintaining a healthy weight. About a third of adults in this country are obese, which is roughly 35 or more pounds over a healthy weight. A third of children and teens are overweight or obese. Obesity increases the risk of many diseases including type 2 diabetes, heart disease and some types of cancer. Beginning in the 1980s when obesity rates in this country started to climb, food became more widely available with the proliferation of fast-food places and the increase in portion sizes, she says. People started eating outside of the home more often and snacking more frequently, Nestle says. She says the current food environment results from the need of food companies not only to make a profit but to report an increase in profits to Wall Street every 90 days — and do so in a highly over-abundant and fiercely competitive marketplace. To lose weight, she says, people have to eat less, but eating less is terrible for business. Hence: politics. Nestle says there are many examples of what she considers food politics run amok. One case in point: The U.S. Department of Agriculture established new nutrition standards for school lunches that went into effect in the 2012-2013 school year. But bowing to pressure from food companies, “Congress insisted that the USDA count the tomato paste on pizza as a serving of vegetables,” Nestle says. About the book, Nestle says: “I want these cartoons to inspire readers to become active in food politics, personally and politically. You can buy food at farmers markets, go to grocery stores that sell healthier foods, support locally grown food and organic food, support animal welfare.